The honours and tributes just keep coming in for Jennifer Jones and her Olympic gold medal winning team. Perhaps the most visible of the tributes, on an ongoing basis, will be the one that adorns almost an entire wall of the team's home club, the St. Vital Curling Club, in Winnipeg. Already three weeks in the painting (with more time spent on prepping and sketching beforehand), artists Michel Saint Hilaire and Mandy van Leeuwen are putting the finishing touches on the gigantic tribute, which should be complete by the end of this week. Altogether, the mural - so big that, apparently, it is easily spotted by passersby on the nearby Trans Canada Highway - runs about 110 feet wide by 32 feet high. “The curling rock is massive," said Saint Hilaire of the piece's largest component, painted by van Leeuwen. At an estimated 25 feet wide and two stories high, that portion of the mural fills Saint Hilaire with amazement. "It’s huge,” he says. Neither Saint Hilaire nor van Leeuwen are what you would call curling fans, but that hasn't stopped them from picking up a few tidbits as the project has evolved. “Mandy is not a curler,” notes Saint Hilaire, before adding that his own, personal, up-close experience with the sport really boils down to having been carted off to the club by his parents when he was a child. Team Jones Vice Kaitlyn Lawes has not had a chance to the see the mural in person, but she likes what she hears about it. "My mother has been by a few times and says it is spectacular, in person," Lawes wrote in an email, this past weekend. 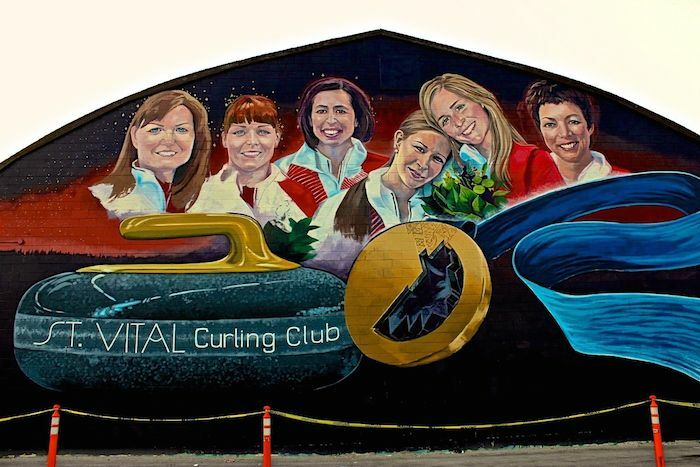 "It is truly humbling and an honour knowing that the St. Vital Curling Club has so proudly had a mural painted on a prominent wall that is so visible on their club," she added. Saint Hilaire figures they've been working together on murals for about eleven years. However, they've experienced something a little bit different this time around, ever since they began painting on the wall of the curling club. Curling fans are passionate and opinionated and protect their heroes vigourously. With the mural being so publicly visible - the wall in question faces a big grocery store parking lot - there has been no shortage of critical input from those fans. “I think people are being a bit more critical because they know everyone on it. They’re stars. We’re under a lot of scrutiny and pressure,” he added. For Lawes, it's yet another in a long line of honours for her and her teammates since winning gold at The Olympics. "We have been extremely busy, but it has been a ton of fun sharing our Olympic experiences and sharing our Gold medal with so many proud Canadians across Canada," she wrote. "Hearing their stories of where they were or so many who did not show up to work that day or how early they got up just to watch our game." "Everything and every event has been truly amazing – each with its own special memories that we will always cherish – the Junos, so many sporting events we got to be part of and were honoured – they all have been so awesome!" 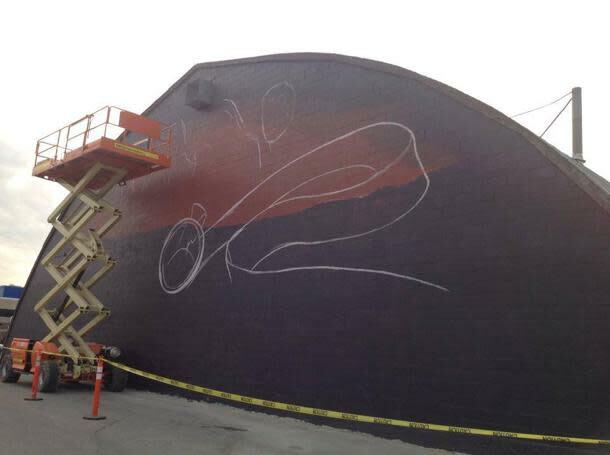 With the mural's finish line in sight this week, Saint Hilaire says that the massive size and importance of the project have gotten into his psyche, if even just a little. “I started to dream about the girls," he admits. "The faces. And I’m like ‘oh, did I do that right?' I googled them and thought ‘oh, their nose is more like this.’ I’m starting to obsess about it,” he chuckled. That obsession is about to end, with final strokes completed by this Thursday or Friday. Saint Hilaire and van Leeuwen will move on to the next great thing after painting for an average of seven hours a day, five days a week, since July 13th. That amounts to about 280 hours, between the two of them. No wonder the project got under their skin. There are a number of connections between Olympic curling and art, these days. 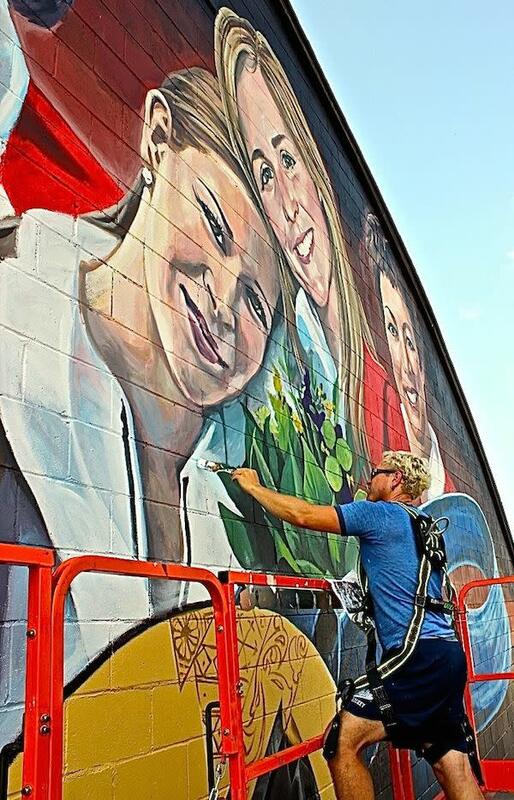 Not only is McEwen being immortalized as part of the St. Vital Curling Club mural, she's been the subject of an Ontario artist's portrait brush as well. And the Harnden brothers - E.J. and Ryan - are in the midst of having Sochi-themed artwork tattooed on their chests to commemorate their Olympic win.